Like other integrations, you need to be an admin in order to enable the Jira integration. 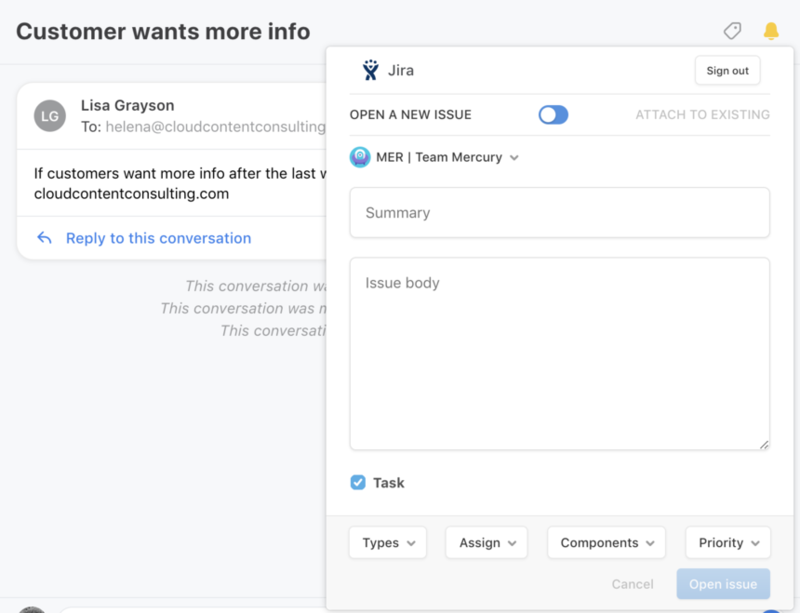 The Jira integration allows you to create a Jira task from Front. Currently, the Jira integration does not support custom fields. Go into your Settings and select Integrations. Click on Jira. Select Settings, and turn the toggle on to enable Jira. If you'd like to reopen conversations after a Jira issue has been closed, then click the Sign in to Jira button. Note: When authenticating the Jira integration, Front attempts to add a webhook subscription for Jira issue updates. This lets Front know when Jira resolves an issue. If Front is not reopening closed issues, please check with your Jira admin to see if a webhook to frontapp.com exists in your Jira settings. It may be necessary to re-authenticate on Front's side with a Jira admin that is able to create webhooks through the Jira API. Click Save to finish enabling the Jira integration. Now, go back into your mailbox view. Next to your subject is a tag button. Click that, and select Jira issue. The first time you add a Jira issue, you will be required to sign in to Jira from Front using your Jira credentials. If you use SSO with Jira, and don't have a password, you can use an API key in place of a password. You can manage API keys here. After that, complete the detail fields to open an issue. When you're done, click Open issue. Your issue is now posted. You will see a tag to the right of the subject line of your email. You can click on that to see the task in Jira. Xavier Dorémus Hi! When you close an issue in JIRA, the conversation associated to that issue should automatically reopen if it was archived. Does that make sense? Cori Morris Hi Cori! It does make a lot of sense, but it doesn't seem to work... I tried a lot a possibilities, but no message comes back to the inbox when I close the related issue. I don't even know where to start, could you please help? Xavier Dorémus Sure! 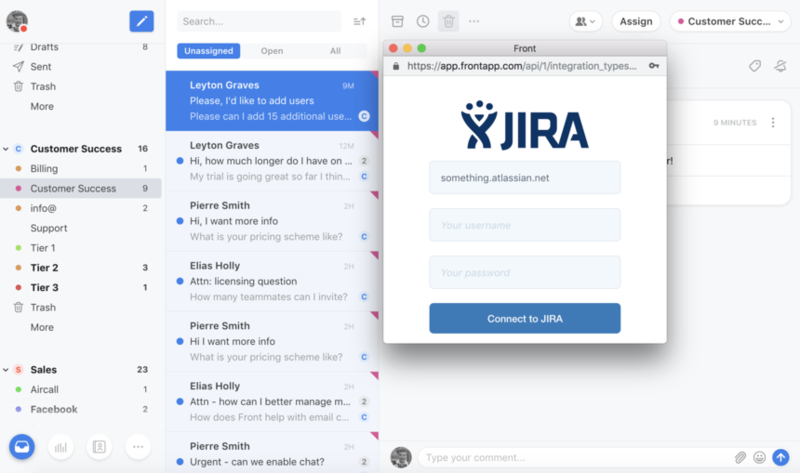 Could you send us an email with the Conversation ID that has the JIRA issue/tag on it? Cori Morris E-mail sent! :) Thanks! My problem has been fixed (quickly and nicely) by Front (it was a proxy problem on their side). Holly Clarke Hi there! At this time, there's no way to automate JIRA-related tasks. Hi! Is there a way to search for the jira ticket number in Front when you've enabled this integration? Searching for "tag:" for example doesn't work, is there another property I can use instead? Hi Caroline Bryngelson ! This tag isn't searchable, you can search for existing JIRA(s) within the plugin though by clicking on the JIRA plugin tag and searching within in it by toggling attach to existing issue to see find the JIRA number. Hope that helps!